The Centro de Desarrollo Emprendedor y Laboral (CeDEL) is Argentina’s first project to achieve EDGE certification from GBCI, but it’s only the beginning of a green building renaissance in Buenos Aires. Mayor Horacio Rodríguez Larreta and the city of Buenos Aires are about to embark on a major effort to bring triple bottom line results to the city. This effort is part of Argentina’s global commitment to the Paris Climate Agreement and designed to help the capital city meet its sustainability goals by placing an emphasis on energy efficiency and smart resource use. An innovation of IFC, a member of the World Bank Group, EDGE is a certification system focused on making residential and commercial buildings in emerging market countries more resource-efficient. There are nearly a dozen projects pursuing EDGE in Argentina, from hospitals to offices to affordable homes. All signal new investment, opportunities and hope for their communities. 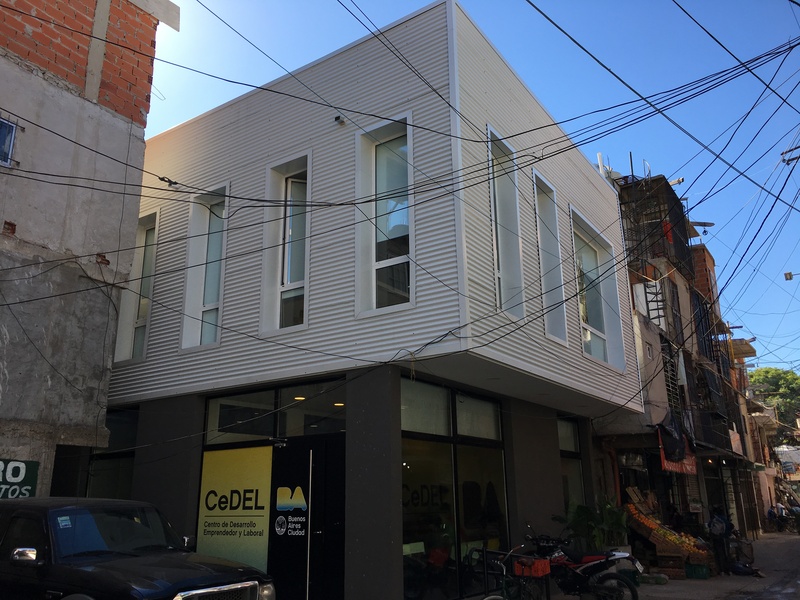 CeDEL is a modern, three-story office building located in the heart of Villa 31, one of Buenos Aires’ poorest neighborhoods. CeDEL was built over the ruins of a notorious drug-distribution center, and now the city is investing nearly $450 million to revitalize Villa 31, an informal settlement without formal infrastructure or legal hook-ups for electricity and water. Argentina, on the whole, has seen a dramatic increase in the cost of electricity, as well as severe droughts—a dire situation for the community and economy at large, but especially so for vulnerable neighborhoods like Villa 31. The mayor and his team see resource-efficient building as a central tenet of their strategy to alleviate poverty, and transform this section of the city into a thriving, affordable neighborhood. In order to achieve EDGE certification, the CeDEL office building achieved a predicted energy savings of 37.99 percent, water savings of 22.6 percent, and 62.88 percent less embodied energy in materials. Their operational CO2 savings are calculated to be 8.16 tons of carbon dioxide per year. With a strong pipeline of EDGE projects, CeDEL is only the beginning for a greener Buenos Aires.